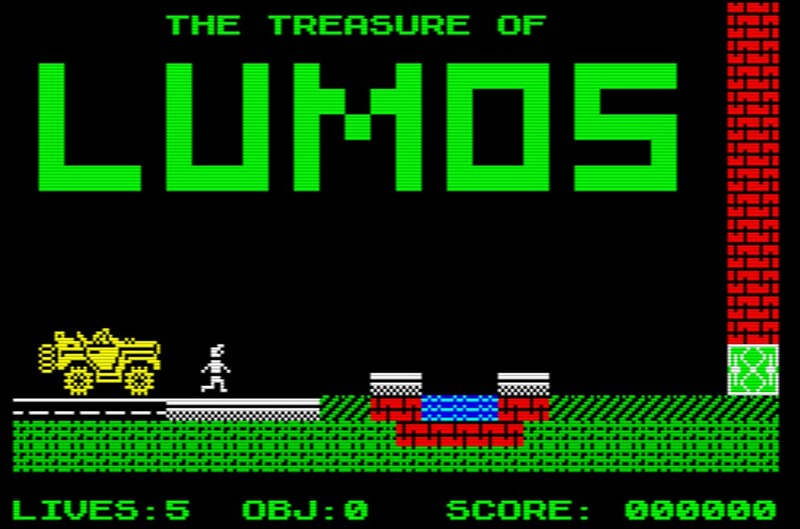 It's time to put aside the remasters and ports and look towards the ZX Spectrum, as Jaime Grilo has released his homebrew platformer ' The Treasure of Lumos ' for the speccy! In this fine little platformer, you play as a treasure seeker on a quest to find the treasure in the Cave of Lumos, but beware not only do you have to find 35 from 40 lootable objects to win the game, you'll also have to deal with traps and some very strange enemies! There are a number of concerns I have with these type of games, and that's if I die will have to restart and collect everything again, will I have limited amount of jump space constantly clipping enemies, and if I fall the smallest of distances will I die quicker than stepping on a rock in Battlefield 3. Thankfully The Treasure of Lumus has none of those quirks(? ), the game is really easy on the eyes, the character controls are smooth, and dying doesn't come with frustration, as items collected stayed collected, you can fall as far as you want and enemies can be easily jumped over that even a person of much younger age can enjoy. As such The Treasure of Lumos is a ZX Spectrum you really should play at least once, well done Jaime!